Not everyone was thrilled when Disney announced five or six years ago that a Dumbo remake had been green-lit. The original 1941 animation is one of the sacred cows of the Disney canon, a charming and heartbreaking cartoon about a baby circus elephant who’s ostracised because of his huge ears, which subsequently come in handy. Though by no means Walt Disney’s most ambitious animation, it including some boldly innovative moments, like the scene where Dumbo accidentally gets drunk and has a vivid hallucination. More importantly, it is beloved, a cherished staple of successive generations, and if there’s one thing people hate, it’s folk messing with their childhoods. 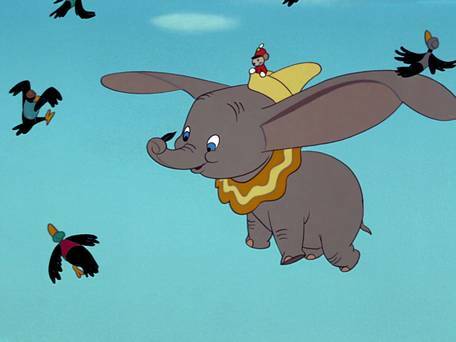 How respectful would the new film be to the original, and why in God’s name was a live-action Dumbo being made? The purists, though, can relax, because the new Dumbo is so different from the old one that it’s practically a standalone. Tim Burton directs, which should tell you something about its aesthetic, and Colin Farrell plays Holt Farrier, a former circus star who’s hired by an unscrupulous ringmaster to look after a baby elephant. They bond, but when Dumbo discovers that he can fly, the unfortunate beast becomes hot property. It’s clever, and while comparisons with the 1941 version are inevitable, they’re also redundant. No harm was done to the original cartoon in the making of this film, and indeed its release may drive curious cinephiles back to it. The thing that struck me most, however, was the dreadful sadness when Dumbo is separated from his devoted mother, who’s declared mad and locked in a tiny cage: when Dumbo visits, their trunks mingle through the bars. This is dark stuff, and when Pixar (now owned by Disney) were being congratulated for introducing the themes of mortality and suffering to cartoons like Up and Coco, everyone forgot that Walt Disney had done it from the start. Walt’s brief stint as a commercial artist awoke him to the rich possibilities of ‘cel’ animation, in which figures and scenes hand-painted on to celluloid sheets could be used to create higher quality, more cost-efficient cartoons. His earliest animated shorts were shown in Kansas City movie houses before the main feature, and became successful enough for Disney to open his own studio, the Laugh-O-Gram. After they set up their Disney Bros studio in 1923, Walt hired Iwerks to draw for him, and in 1927 they scored a big hit with Iwerks’ character Oswald the Lucky Rabbit, the mischievous star of a series of animated shorts. The studio expanded, but disaster struck when they lost the rights to Oswald. Under pressure to find a character to replace him, Walt remembered a rotund mouse he’d drawn regularly in his youth. Iwerks used rough sketches by Disney to create a jovial anthropomorphic rodent with a cheeky streak and a winning smile. Disney planned to call him Mortimer until his wife Lillian suggested the more appealing name of Mickey. Within a year Mickey Mouse had eclipsed Felix the Cat to become the most popular cartoon character in the world. But instead of trading profitably on Mickey’s success, Walt dreamt of new conquests, and in the mid-1930s began planning the first feature-length animated film. During its fraught production, Snow White and the Seven Dwarfs (1937) ran so far over budget that it became known as “Disney’s Folly”. Everyone was sure it would end in disaster, and both Disney’s wife and Roy tried to talk him out of making it. But Walt was on a mission. The budget shot six times over Walt’s estimate, and he had to remortgage his house. But the finished film was sublime, a superb reimagining of the German folk tale. It ran for years after its original release, and became the highest grossing sound film to that date. Snow White’s success allowed Walt to build a new studio campus in Burbank, and dream ever bigger dreams. But by the time he turned his attention to the story of Dumbo in 1940, the company was in big trouble. Two films in a row, Pinocchio and Fantasia, had flopped, partly due to the outbreak of war in Europe, and the studio was deep in debt. Walt was also in mourning. In 1938, flush from their success with Snow White, Walt and Roy had bought their mother Flora a pristine new home near the Disney studios in Burbank. She loved it, but complained of a smell from her gas stove. Studio repairmen were sent to fix it, but on November 26, 1938, Flora was found dead at home, probably from asphyxiation. Walt was devastated, and did his dark thoughts inspire the tragic separation of Dumbo and his mother? In any event, Dumbo’s enormous box office success saved the company. During the 1940s and 50s he oversaw a string of magical children’s animations. Bambi (featuring another dead mother), Cinderella (an orphan, remember), Alice in Wonderland and Peter Pan are still watched by small children today, and represent a high point in the history of animation. Disney once said “I sell corn, and I love corn”, but what he was actually selling was a kind of essence of American optimism. Though tragedy often impinged on his universe (I’m still traumatised by my first viewing of Bambi), his stories tended to end happily, and took place in worlds flocking with kindly cartoon characters and god-fearing animals.